Four Arlington County police officers, two sheriff’s deputies, and a 9-1-1 dispatcher were honored this week for their exemplary work in responding to people in a mental health crisis when on a call or on the job. 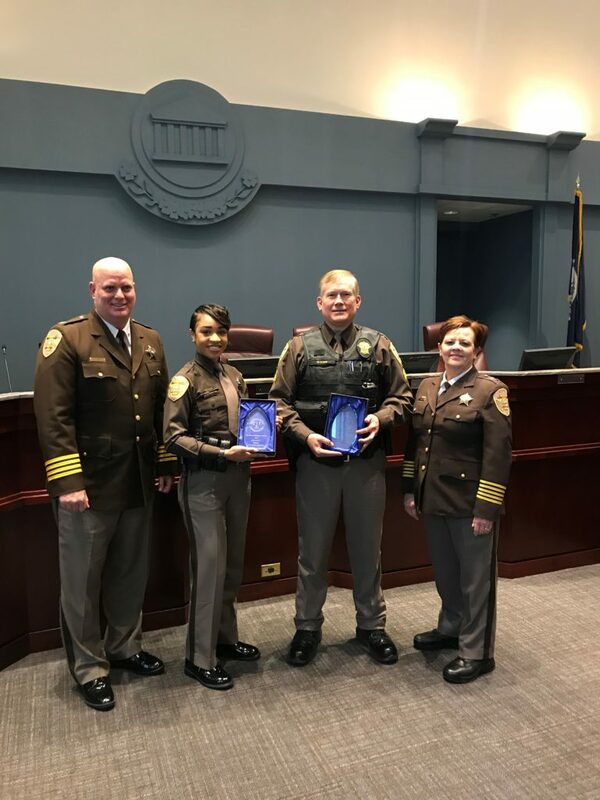 The honorees were recognized as part of the County’s Crisis Intervention Team (CIT) program, which trains public safety personnel on the skills they need to interact safely and effectively with mentally ill individuals and how to provide options beyond incarceration. 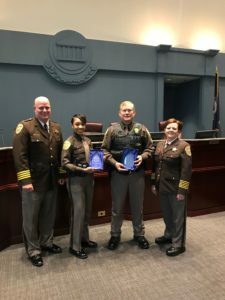 Two individuals received recognition for demonstrating outstanding CIT skills over the past year — Sgt. O’Neill of the Arlington County Sheriff’s Office and Officer Manning of the Arlington County Police Department. Officer Manning has been the police department’s lead CIT instructor for the past four years, dedicating numerous hours to training hundreds of officers from multiple agencies within the region. He was also recognized for his ongoing efforts to improve the County’s CIT program, including soliciting input and revamping course structure and scenarios, and developing both an Advanced CIT class and a CIT Refresher course. And he pro-actively volunteers for calls involving mental illness and often goes beyond the initial response to ensure that clients obtain the services they need. Sgt. O’Neill serves as Zone One Sergeant for the sheriff’s office on the night shift — a time when mental health staff is not usually on site. O’Neill has worked to identify mental health inmates in a timely manner and quickly refer them for follow-up, in addition to de-escalating inmates in distress, talking at length to inmates, and meeting other needs they might have. He has been an advocate for inmates to receive their psychotropic medications in a timely fashion and has helped them communicate with mental health staff about any medication concerns. Another of this year’s honorees was emergency communications technician April Olivera. Last October, Olivera received a call from an insurance provider who had concerns about a member they were speaking to on another line and believed was suicidal. Olivera put in a call for Arlington police to check on the caller’s safety, and kept the caller on the line until officers arrived. 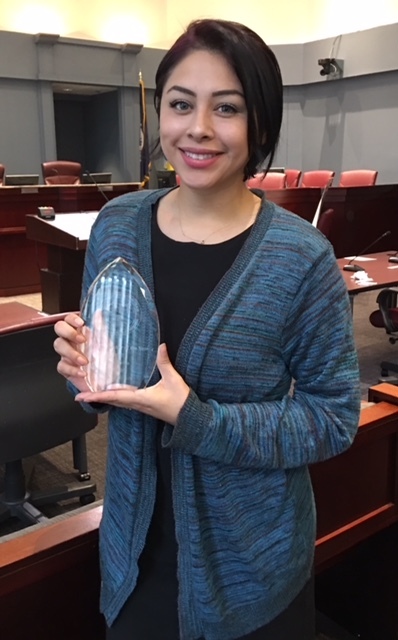 As the caller grew increasingly agitated, at one point threatening to barricade himself in his home if officers showed up at his door, Olivera used her CIT skills to reduce the escalating behavior and reassure the caller enough to open the door. 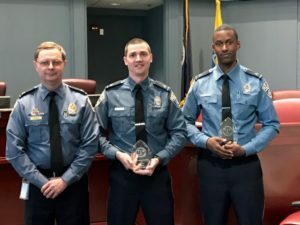 Three members of the police department—Corporal Chattillion, Officer Green and Officer Soules—were honored with a CIT Intervention of the Year award for their response to a resident who was threatening suicide, including making initial contact with him at home, continually working to de-escalate the situation, and developing a rapport with the subject so he could be evaluated and treated by medical staff. In the sheriff’s office, Deputy Anderson received a CIT Intervention of the Year for her skills in helping an inmate at the County jail. After arriving at the jail, the inmate continued to be uncooperative and combative with deputies and staff. Anderson was able to use a combination of communication skills, empathy and patience to help the inmate comply and get her the treatment she needed. In 2008, the Arlington County Police Department and the County’s Department of Human Services established the Crisis Intervention Team (CIT) program. It is internationally recognized for its work to unite law enforcement officers, emergency dispatchers, mental health treatment providers, consumers of mental health services and other community agencies to help connect individuals with community resources, emergency assessments and crisis stabilization services. Arlington police officers have approximately 2,100 interactions a year with individuals suffering mental illness. Nearly 70 percent of the police department’s operations division staff is CIT-trained, and CIT officers are available 24/7 to assist with mental health emergencies. 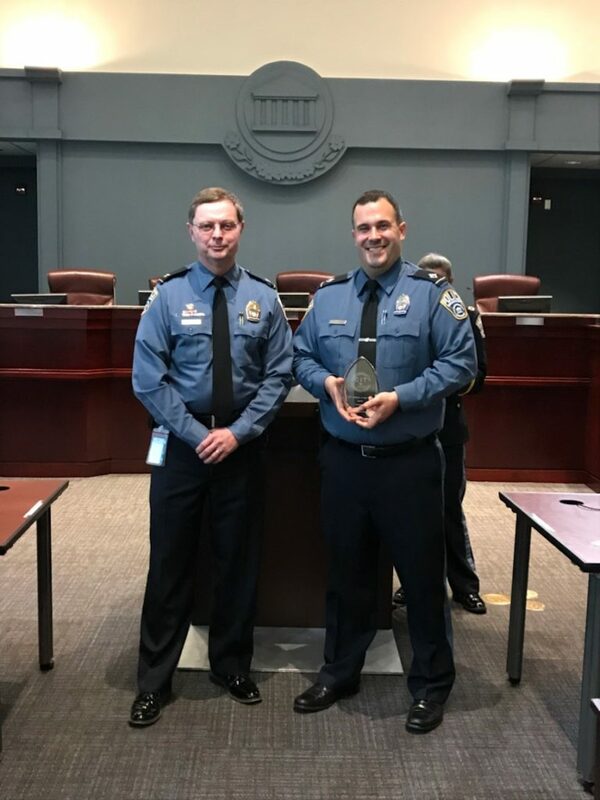 Learn more about the Crisis Intervention Team (CIT) and the annual CIT awards.